Norfolk's Virginia Zoo -- You've Come a Long Way, Baby! The first time we went to the Virginia Zoo was about 17 years ago. 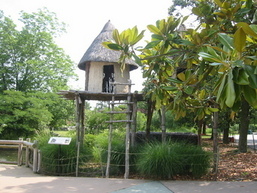 The zoo has completely refurbished its exhibits, added really spectacular landscaping, a unique African theme, and made it into a sweet, lively attraction. Sure, it’s still not the San Diego Zoo, but it’s easy to navigate and won’t leave you exhausted like bigger parks. You start at the fountains (perfect for cooling off on a hot, humid day). Try to stop the world...that is, a 5-foot, 17,500 lb. granite globe, rotating on a thin stream of water. Once you get past the fountain, head to Africa...or a good replica, complete with an African market village and a savannah. There’s a boardwalk (perfect for getting excess energy out of little legs) that winds past elephants, mandrills, giraffes, zebras, meerkats, and more. The habitats are well-done…very un-zoo-like, and beautifully landscaped. Other exhibits house tigers, ocelots, squirrel monkeys, and emus… reptiles. There’s even a reptile/creepy-crawly house which (for some reason) I find fascinating. I guess I get a little thrill from knowing that otherwise deadly or obnoxious creatures are just a pane of glass away. If you’re lucky, you may be treated to a glimpse of one of the zoo's newest additions, which might include baby giraffes, baby squirrel monkeys, or baby lions. For our kids (who don’t share my fascination with snakes and creepy-crawlies), the two highlights of the Virginia Zoo are the prairie dogs and the petting zoo. Our kids love popping up in the viewing bubbles at the interactive prairie dog habitat so they can get face to face with the perky little creatures. We always finish our tour in the Virginia exhibit, which includes a replica of a working Virginia farm. Huge, fat pigs. Wooly sheep. And plenty of goats to pet. Relax, moms…they have plenty of hand sanitizer pumps right outside the petting area. To Eat...Or Not to Eat at the Virginia Zoo? 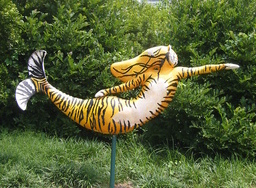 They have their own Norfolk Mermaid Lion! If you’re hungry, they have two food spots: Beastro Café (snack foods and ice cream) and the African Village Restaurant (located in—you guessed it-- "Africa") which has a more extensive zoo menu (burgers and the like). None of it is what you’d call spectacular cuisine, although African Village provides an air-conditioned respite on a really hot day. 1. Arrive when the zoo opens at 10 am. 2. Skip the over-priced and underwhelming zoo food. 3. Bring along a snack. 4. When you’ve completed your visit, go to nearby Baker’s Crust for some of their tantalizing sandwiches and crepes. Or, for something really different and nostalgic, take a trip to nearby Doumar's Drive-In, a 50's diner throw-back where you can pull up your car to dine on burgers, fries, and shakes, just like they used to in the old days. Admission is $14.95 for adults, $12.95 for seniors (age 62 and over), and $11.95 for kids ages 2-11. 2018 Deal: Get free admission to a different local museum April-Sept.
Don't miss the Virginia Zoo Train if you have little ones. It's $2 per rider and runs throughout the day during good weather that's 50 degrees or above. AAA members and military members (with valid ID) get $1 off admission. Norfolk College students with valid ID are free. Individuals with an ADA-recognized disability and one companion are also free! The zoo sometimes runs two-for-one discounts on Living Social and Groupon. The Virginia Zoo is open from 10-5 daily except for New Years Day, Thanksgiving, Christmas Eve, and Christmas. 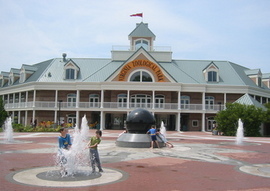 The Virginia Zoo is located at 3500 Granby Street in Norfolk. Visit their website at www.virginiazoo.org. They've become famous for their spectacular flowers and landscaping. If zoos are your bag, consider visiting the Virginia Aquarium or the Virginia Living Museum. Both offer hands-on fun and lots of unusual creatures. Virginia Aquarium (located near the Virginia Beach downtown area) has over 300 hands-on exhibits and 700,000 gallons of tanks featuring sharks, huge sea turtles, and exotic fish and creatures, such as a rare albino alligator. My kids love Virginia Living Museum for touchy-feely fun thanks to their touch tanks full of horseshoe crabs, sea urchins, and more. Norfolk is full of other great attractions and things to do, some of them free. For our recommendations on the top things to do and see in Norfolk, click here.